Let 2Evolve Technologies simplify your infrastructure and save you money with the leading platform for calling, conferencing, video, and sharing. With 2Evolve Technologies and Skype, you and your team can work better together. Our award-winning Migration and Support team specializes in Skype for Business deployments with over 35,000 successfully implemented seats of Skype for Business. Skype for Business deployments/migrations are multi-phased projects. 2Evolve Technologies has the expertise in project management, change management, technical consulting, and technical support needed for the successful implementation and continued support of Skype for Business. Three Stages for Successful Skype for Business Deployment. Plan – Each Skype for Business deployment is unique and requires and in-depth understanding of your environment. We will undertake planning and design tasks to define expected business value, assess readiness, and execute remediation activities. Deliver – 2Evolve Technologies will effectively implement and deliver Skype for Business online services to align with your business needs and increase your ROI by driving adoption through layering on new feature and capabilities as they are released to deliver rapid success and add value. Operate – To ensure your deployment remains successful, we can manage and maintain your Skype for Business environment through a combination of reporting, monitoring, and proactive support of your environment. Complete Meeting Solution – Take advantage of audio, video, and web conferencing tools to join meetings easily—with a single touch or click—enjoy HD video calls, and work better together with desktop and application sharing. Plus, meet with up to 250 people—whether they’re on Skype or not. Any Device – Access Skype for Business anywhere and on any device. Being mobile is critical in today’s environment. Find anyone in your network and work productively from wherever you are with the app available across Android, iOS, Mac, and Windows devices. Office 365 Integration – Integrate all of your Microsoft applications for seamless transitions with fewer interruptions. With integrated real-time co-authoring, desktop sharing, application sharing, and PowerPoint presentations, Office 365 and Skype for Business help you collaborate more effectively than ever. 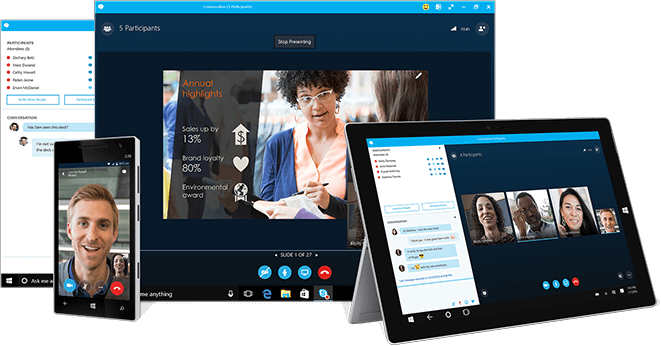 Security and Compliance – Skype for Business brings together the familiar experience of Skype with the security, compliance, and control that users have come to expect from Microsoft. With built-in encryption enabled by default, Microsoft offers end-to-end security and compliance. Cloud PBX – Businesses in the modern world need a modern voice solution: eliminate separate, private branch exchange (PBX) phone systems with the power to make, receive, and transfer business calls built into Skype for Business. PSTN Conferencing – Anyone can join your Skype meetings—even without internet access—using local dial-in numbers to reduce calling charges, and organizers can dial-out to pull attendees in. PSTN Calling – Subscribe to calling plans from Office 365 and use existing phone numbers or get new ones. Add PSTN calling to Office 365 Enterprise E5 for $24.00 user/month, annual commitment. Skype Meeting Broadcast – Broadcast Skype for Business meetings on the internet for to up to 10,000 people, who can attend in a browser on nearly any device. Meetings include real-time polling and sentiment tracking, plus Yammer, to enable dialogue during the broadcast.